We are very excited to have Anthony Medina as the new Program Director of our Youth Boys program at BACKCOURT HOOPS. Anthony remains the UST Head Men’s Basketball coach as his primary commitment, but we are so thankful to have Anthony lead our Youth Boys Program at BACKCOURT HOOPS. UST’s 2nd ever Men’s Basketball coach was not difficult, as the Celts turned to University of St. Thomas alum and ex student-athlete Anthony Medina. During his 3 year career at UST, Medina was a 2-time All-Conference player who shot over 40% from 3-point range for his career. He graduated from UST as the All-Time leader in points, rebounds, minutes played, games played, and 3-pointers made. Medina, originally from El Paso, Texas, played his high school basketball at The Woodlands High School before joining the UST team in their inaugural year. He graduated in 2012 from UST with a BA in English. In addition to an outstanding collegiate playing career, Coach Medina brings his knowledge of player development to the head coaching position. Throughout his time at St. Thomas, Medina served as the Program Director CUTtheNETS and now for BACKCOURT HOOPS Select Basketball Academy in The Woodlands, Texas. In addition, he spent 7 summers working for Coach Krzyzewski at the Duke Basketball Camp. 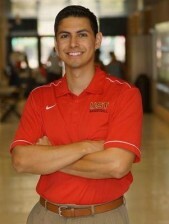 Following his graduation from UST, Coach Medina was hired as a Graduate Assistant at Missouri Western State University. At MWSU his primary duties included player development, recruiting, scouting, academic success and community outreach. In his time at Western he recruited 2 All-Conference players and organized many service projects for the Men’s Basketball team. After graduating with a Masters of Applied Sciences in Sports and Fitness Management in May of 2014, Medina returned to The Woodlands as varsity assistant at Oak Ridge High School. In addition to his coaching duties, he worked with both the Special Education and English departments as the Developmental Reading teacher and campus Dyslexia Specialist.